"An Amaretto flavored custard filling goes wonderfully well with chocolate cakes." Combine sugar, cornstarch, and salt in saucepan. In a separate bowl beat eggs and mix together with milk. Stir into dry mixture. Cook over medium heat, stirring constantly, until thick and bubbling. Cook for 2 minutes more. Remove from heat, add almond liqueur and stir well. Cover surface of filling with plastic wrap to prevent film from forming and chill completely before using. 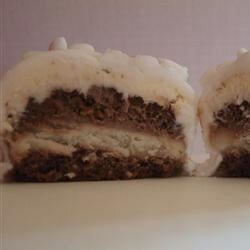 Stout in the batter, whiskey in the chocolate filling, Irish cream in the icing! This filling is a basic custard, very nice texture. I did need to add more amaretto. Very good and easy to make. I substituted almond extract for amaretto liqueur. Perfect for my petit fours! Not too heavy of a taste, but just enough! I love the custard texture. Maybe it was something I did wrong, but it tasted like tapioca pudding to me. I will NEVER use this again. I didn't put this on my cake. This is good. A the consistency of a thin pudding. Great on chocolate cake!